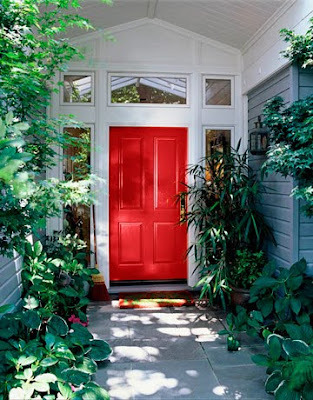 Paint that front door a fresh, bright color. Make a striking note with red, cinnamon or green. Please stay away from beige if possible. The idea is to POP, not yawn. Hang a welcoming wreath of natural, seasonal materials on that freshly painted door. If birds continually build nests, purchase an artificial bird at the craft store and perch it in your wreath. You won’t see a nest again. At Halloween, try some festive decorations. Come into the foyer! If you live in an apartment and space is limited, hang the largest mirror you can find on the largest wall. Be sure to hang something interesting on the opposite wall for a good reflection. A mirror actually works in any size space to enlarge and brighten. And, for an added bonus, you can check out how good you look as you leave every morning. (Try not to look at night when you get home). Buy a slim sofa table or recruit a piece from another area of your home like a chest or a plant stand to put in the foyer. On the piece, place the largest vase you have and fill it with natural blooms – flowering forsythia in spring or dogwood branches, in the fall use those orange berries that I can never remember the name of and at the holidays use cedar or evergreen branches for that heavenly scent. Drama is what we are looking for. Not a floral person? Use a pretty lamp for ambiance to offer a soft “hello” in the evening. You need a rug! A good quality rug will stand up to a lot of wear and will be easier to clean than an inexpensive one. Try something wild like a leopard or jungle print or a brightly colored wool rug. Do you have a place for a chandelier? Nothing beats a beautiful chandelier with a dimmer attached. This will make your space more inviting and make your guests feel pretty. Remember, your entry is the passageway into your home. When you walk in, it should “speak” to you in a welcoming, pleasing manner. And a little drama thrown will make it special.